Soup & Sandwiches served 7 days a week. Your choice of fillings on white or grain bread toasted to a golden brown. Traditional Tayto and a variety of Pringles. 10 inch gluten-free base available at no extra charge. Please note that the pizza will still be cooked in the same pizza oven and there will be a risk of cross contamination so this option is unsuitable where there is a potential severe allergic reaction. 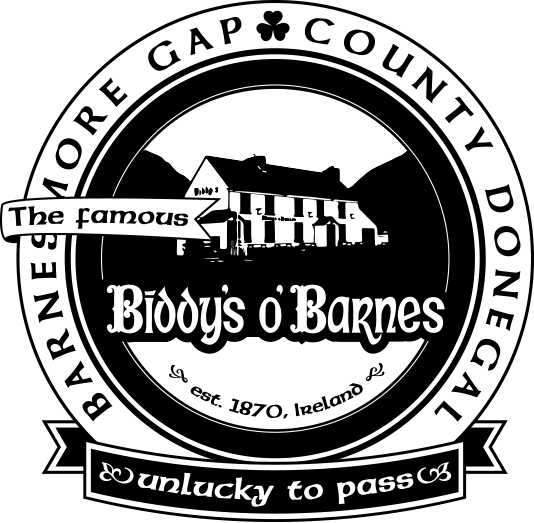 Biddy's O'Barnes is a famous roadside Pub in Barnesmore Gap, Co. Donegal, Ireland. Since it's days as an Inn, dating back to the 18th century, a time when the Coach was the main form of transport, Biddy's was a stopping point, where horses were rested, and travellers relaxed before the next stage of their long and tiring journey through the Gap. Today we continue that tradition.